About a week before Christmas I decided I wanted to make a few gifts. My self-imposed parameters were no trips to the store, no spending money on fabric and something quick, easy and fun. I decided on the thirty minute zipper pouches that I found at Kelby Sews. They are a lot of fun to make and very satisfying. I do follow the basic tutorial that Kelby posted as her method of making these bags is wonderfully simple. However, I don’t strictly adhere to her dimensions. I have a large zip lok bag of zippers that I have collected from various thrift stores. Many, really most, of the zippers I have are very long, 16-22″ or so. It doesn’t matter as the ends are cut off once the bag is assembled. In addition I, like most quilters, have a large drawer full of batting scraps. The long pieces that are trimmed from the edges after quilting a project are stored there and are perfect for this project. With the zippers and batting on hand, I just had to pull large scraps that went well and coordinated with the zippers. That was probably the toughest part of the process, matching fabrics to whatever zippers I had. Looking at the photo below, you will see fabrics from Kaffe Fassett, Henry Glass, Allison Glass, Amy Butler, and several by Kathy Davis. A variety of wonderful colors, to be sure; it felt great to use up so many scraps! The tutorial tells the maker to use adhesive and glue the fabric to the batting. I chose to quilt them together instead. I think it adds an extra touch, and also…I don’t have any spray baste on hand! 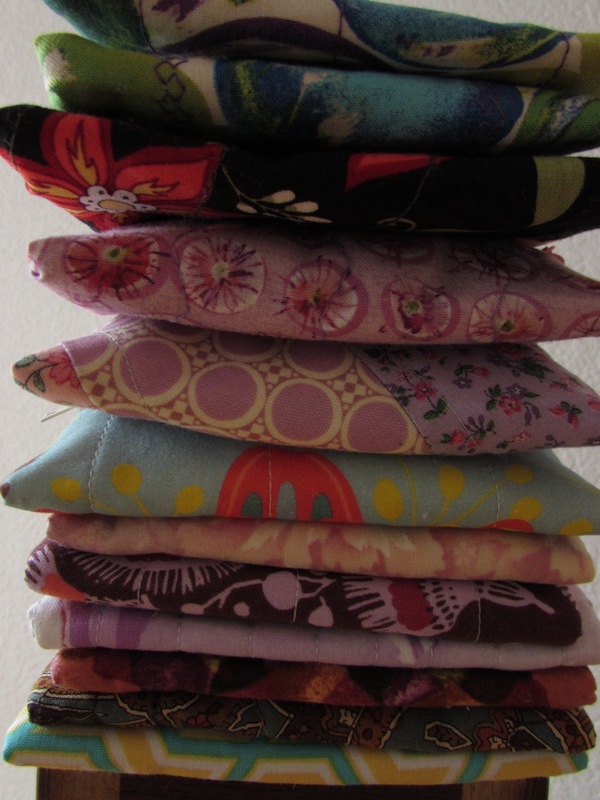 If you look at the picture you will see the bag that is the fifth one down in the stack, is made of multiple fabrics. I used an orphan block for that one. It was a practice block I used when I was trying to make a herringbone block. Fortunately it was long enough to make a pouch with, I just had to cut the width down. I loved that pouch because it looked like I had pieced it. I put some yummy Evelyn and Crabtree lotions in the pouches and mailed them off to my sisters and a quilty friend in Michigan. I also gave them to my mother, my mother-in-law, and sister in law. For my two nieces, I filled the pouch with chocolate and a gift card. In addition to making these zipper pouches, I made a couple of heat packs for my kids. These are filled with rice and can be heated in the microwave to soothe a sore muscle. (They can also be stored in the freezer and used for muscle aches and pains.) I made one for myself a long while back and love it. While it is fun to make, and give, gifts, it is also fun to receive a quilty gift. 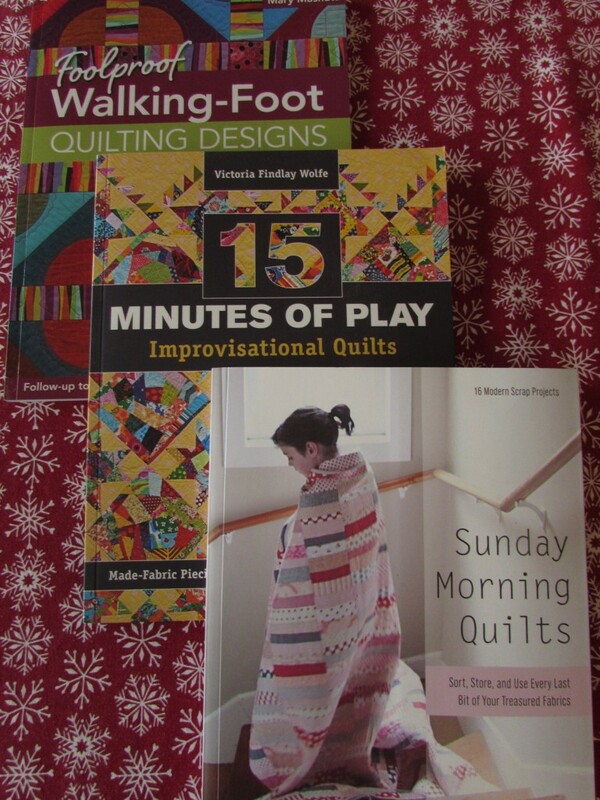 This year I received three quilting books. I have a list of books that I want to add to my library and received three of them. Since receiving it, I have already read Fifteen Minutes of Play, by Victoria Findlay-Wolfe, in its entirety. I love it and spent a few minutes yesterday creating ‘Made-fabric’. I am planning to incorporate her ideas into my projects for RSC16 and will post more on that later. Sunday Morning Quilts has some wonderful ideas for quilts using mostly scraps. Written by the quilt world’s scrappy quilting queens, Amanda Jean Nyberg and Cheryl Arkinson, it is filled with great ideas. Mary Mashuta’s recent book, Foolproof Walking-Foot Quilting Designs, is also wonderful. Mary has some great ideas for quilting designs other than straight lines with a walking foot. I have just taken a peek at that one and already learned a few new ideas that I will try soon. These three books will provide a great deal of inspiration and instruction for upcoming projects. If nothing else, just looking at the photos of the quilts made by these amazing women is so satisfying! Happy New Year to all of you. May 2016 be a year of peace, good health, and many hours of stitching! Linking to Crazy Mom Quilts, Freemotion by the River, and Let’s Bee Social. This entry was posted in Christmas, Sewing Projects and tagged handmade christmas gifts, kelbysews zipper pouch, quilting books on December 28, 2015 by Bernie. Looks like you gave AND received some great gifts! Paige, I absolutely love the new books. Sewing up some Christmas gifts was a lot of fun. 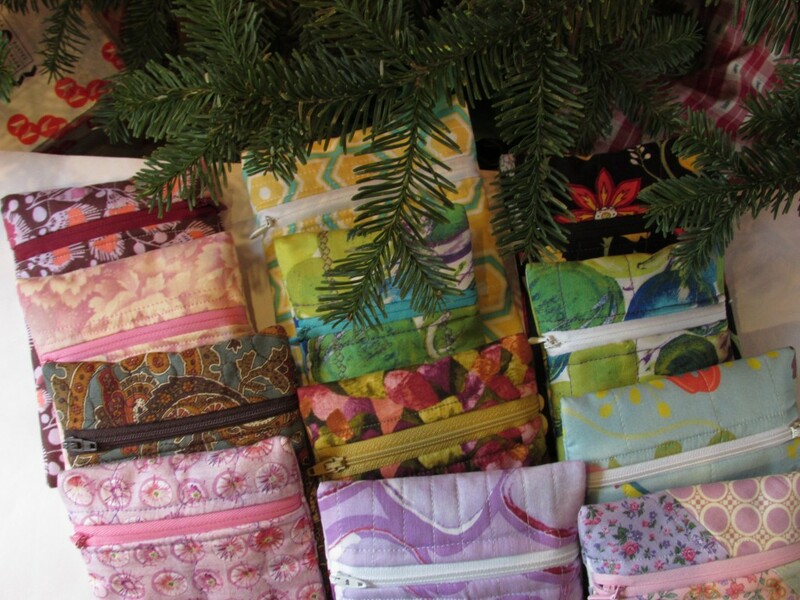 Picking out fabrics for people is satisfying-a fun way to celebrate the holidays! Wonderful zipper pouches! Just got the download! Happy New Year! Pretty pouches indeed. Happy New Year to you as well Vera! Even though they were ’30 minute’ pouches – looks like you spent a good bit of time, as you made a bunch! 🙂 I love zipper pouches as a holder for small gifts or cash. Yay for quilting books as gifts! I have so many on my list, I can’t decide which ones I REALLY want to own, and therefore don’t buy (or ask for) ANY. Which is just silliness, isn’t it?! For the quilting books, y might consider buying them used. When you look at Amazon, you can often order a used copy for a discount. That way you aren’t investing as much. I have been fairly particular about which books to actually buy. These three are all looking fantastic though. Good inspiration and lots to actually learn. What a great idea! I snag quilting books from the thrift shops – love to dream of quilting possibilities. Visiting you from the Crazy Mom Quilts linkup. What a lovely way to “wrap” gift cards! They look like a great use of your zip collection and those leftover long bits of batting that you can never bring yourself to throw away. Merry Christmas and Happy New Year! Hi Carie, Happy New Year to you! I hope the year is filled with joy and peace for you and your family. I love my little zipper pouch and the hand cream too! ?? Thank you!!! I’m so glad you liked it! Happy New Year Sissie. Look at all those adorable little pouches. Very cute and seemingly very quick. Might have to give these a try. Hope you had a great holiday. Happy New Year! They are a super fast project. Especially after you knock the first one out. Sunday Morning Quilts is one of my favorite quilt books! I’ve been curious about Fifteen Minutes of Play and look forward to your review. Sounds like you had a lovely holiday; merry merry and happy quilting! I suspect you would love the 15 Minute of Play book Cassandra. Victoria gives some great ideas on thinking about creativity, using scraps, fun blocks to make with scrappy pieces. I really like it. I read through it once already and now want to go back and start to implement some of her ideas. Happy New Year. Hoping you enjoy good health all year long!! I am going to make some tonight! I love them. Thanks for sharing. I’m so glad you like them Dona. Happy New Year!